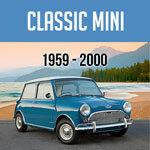 The Innocenti Mini Cooper was built from September 1965 untill January of 1975, six variants were built within these dates. 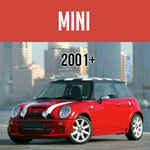 The production of the Mini started in Italy as a assembly line for parts shipped from the UK in CKD kits. While the first models were 850cc, by March of 1966 the 998cc was being assemnbled along side of the 850. The 850cc version continued thru Feb of 1972. In 1973 the first 1300cc Innocenti was introduced. The most popular of all Innocentis being the 1300 Export with 28,200 examples being built. So popular was the Export that in addition to the vehicles being built at Milan Italy, that a second factory was built at Seneffe in Belgium, all bodies were still supplied from Milan. The most noticeable external features of the Export in standard form are a black plastic grille with a plastic chrome "Innocenti" badge (as later used on ERA turbo’s), indicator side repeaters on the front wings, ‘EXPORT’ badges at the lower end of the ‘A’ panels, quarterlight front windows / Wing Windows (non-opening on German market cars), reversing lights and the boot lid with a continental square number plate recess illuminated from above by a chromed plastic lamp. Engines for the Export were based on the ‘closed’ block Austin 1300GT variety, but with a Morris sticker on the rocker cover. Initially the prefix for these was 12H635X, then it was changed to 12H719X in July 1973 when the modern pot joints were introduced on the drive shaft outputs. The most noticeable feature of the interior is the six dial full width dashboard, being the most innovative of any Cooper variant ever built; it was the first to have a rev counter as standard equipment. Upholstery came in two colors either black or beige with cloth inserts on all seats.